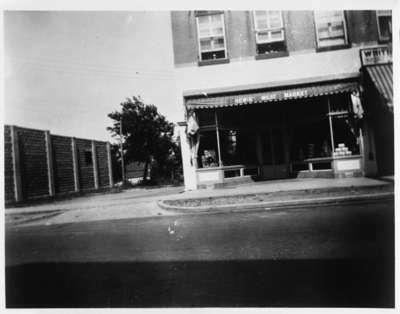 A black and white photograph of Hewis Meat Market and A&P Store. In the centre of the photograph is a vacant lot. Hewis Block was located at 121 Brock Street South. This vacant lot (129 Brock Street) later became the site where the Brock Theatre was built in 1937. Hewis Meat Market and Vacant Lot, 1937, Photographer Unknown. Whitby Archives 001-000-224.